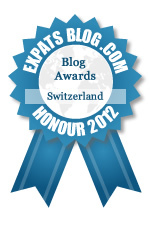 ExpatsBlog.com Expat Blog Awards 2012: Switzerland Honourable Mention Award! This blog won the Honourable Mention Award for best expat blog in Switzerland! This is a great blog. I enjoy reading about the struggles of a foreign country and adapting to their alien ways and actions. This is my favourite blog. It always makes me smile!